Robert C. Solomon is the Quincy Lee Centennial Professor of Philosophy and Distinguished Teaching Professor at the University of Texas at Austin. He is the author of, among many other books,From Hegel to Existentialism. Kathleen M. Higgins is a professor of philosophy at the University of Texas at Austin and the author ofNietzsche's Zarathustra. 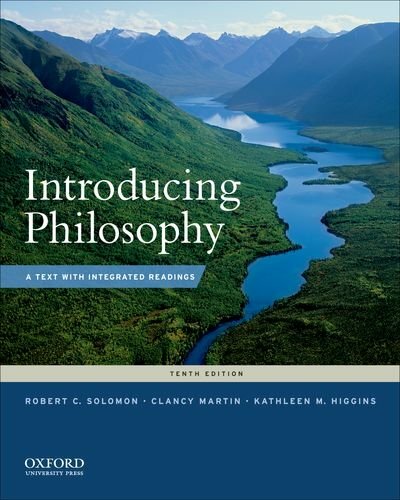 Together, Solomon and Higgins have writtenA Short History of PhilosophyandReading Nietzsche. They live in Austin. From the Hardcover edition. Monism, Materialism, and Immaterial "Stuff"
Renï¿½ Descartes Renï¿½ Descartes, On Substance; from "Meditation VI"
The Rationalist's Confidence: Descartes Renï¿½ Descartes, from "Meditation I"; from "Meditation II"; from "Meditation VI"
Consciousness and the Self: From Descartes to Kant Renï¿½Descartes, from "Meditation VI"
Voices of Protest Malcolm X, On Being "African"; from "At the Audubon"
What Is Consciousness? Renï¿½ Descartes, from "Meditation VI"; from "Meditation III"
The Problem of Dualism Renï¿½ Descartes, from "The Passions of the Soul"
The Identity Theory J. J. C. Smart, from "Sensations and Brain Processes"
The Problem of Consciousness Sigmund Freud, On the "Unconscious"
Radical Freedom: Existentialism Jean-Paul Sartre, On "Absolute Freedom"
Morality and Sentiment: Hume and Rousseau David Hume, On "Reason as Slave of the Passions"
The Creation of Morality: Nietzsche and Existentialism Friedrich Nietzsche, On "Morality as Herd-Instinct"; On "Master and Slave Morality"